Seedy Sunday is less than a month away! Here’s a summary of what’s happening on the 3rd of February. Venue: BHASVIC, 205 Dyke Rd, Hove, BN3 6EG. £3 entry, kids free! At the heart of Seedy Sunday is the giant seed swap table. Bring seeds to swap saved from last year’s crops. Seed saving experts and gardeners will be on hand to offer all the advice you need to choose and grow your seeds. 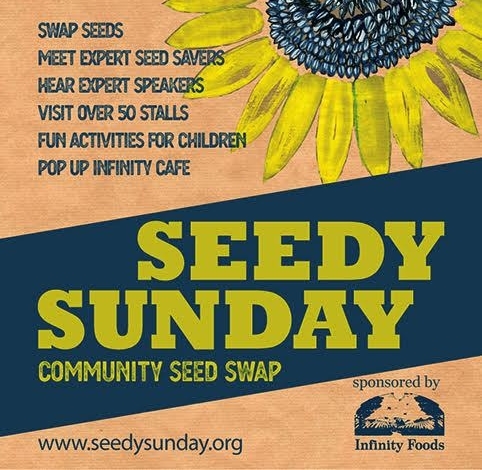 You can collect Seedy Sunday envelopes from Infinity Foods in Brighton. No seeds to swap? Simply make a 50p donation at the seed table. We have already prepared over 2500 packets of seeds to get us started on the day! This year we have herbalists, gardeners, authors, university lecturers, and an international NGO speaking about weeds as medicine, wildlife gardening, sustainable food production, and pesticides. Joshua the Gardener – after the popularity of his ‘no dig’ talk last year and the queue of people waiting to ask him questions, we are delighted to have Joshua join the panel. He has lots of advice to share about no dig gardening, organic gardening and design. Chris Smith from Pennard Plants – another Seedy Sunday favourite. Pennard plants specialise in heritage and heirloom seeds and Chris is a gold medal Chelsea flower show winner, accomplished speaker and potato expert. Ros Loftin is our seed saving expert and is the heart and soul of the seed swap since 2012. A trained horticulturist, she has been saving seeds for the past 10 years, and each year brings between 20-30 different varieties of open-pollinated heritage tomatoes to swap on the seed table. The panel with be chaired by our very own Alan Phillips! He has been involved with Seedy Sunday since the beginning (back in 2002! ), including serving 5 years as the Chair. He is an integral part of Brighton & Hove’s vibrant organic gardening community, providing expert advice to many novice organic gardeners on our Community allotment. Visit more than 50 stalls from specialist growers, seed merchants, charities and community groups and more. As ever we have some fun and inspiring activities for children and their parents or caregivers. Making decorations, planting seeds and discovering how to make an ‘ecobrick’ from plastic waste, there’ll be plenty to keep young people interested on the day. A special thanks to Infinity Foods who generously sponsor us every year, display our posters and give away our seed envelopes in their shop on North Road, Brighton. They run a fantastic stall on the day selling organic seed potatoes, and the award winning Infinity Cafe will be upstairs to serve teas, coffees, cakes and lunches.